Collects Black Widow (2014) #1-6. You’ve seen Black Widow as an Avenger and even an agent of S.H.I.E.L.D. But on her own time she searches for atonement for her past as a KGB assassin – in ways of which those teams just wouldn’t approve. The Black Widow goes undercover in Russia, but from its cold streets, the Hand of God reaches out to crush her…and it is as merciless as its name implies. Outmatched by the brute force of a powerful new villain, Natasha faces her deadliest test, and discovers a deadly plot unfolding that spans the entire globe. First, a HUGE thanks to my OTSP Secret Sister for sending me this on my kindle! I finished a book on Sunday and then wanted something “light” to read for the rest evening and this seemed like the perfect choice- and it was. I’ve been a fan of graphic novels for years and I love how they can be for any type of reader thanks to the diversity of the comic and graphic novel world. Being a Marvel fan and a (most of the time, thanks to my hair stylist…) redhead, I’m a BIG fan of Black Widow. She’s tough and she gets things done on her own initiative! But, what about this particular collection of the character, right? 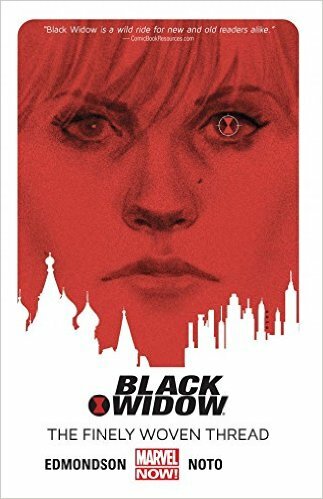 If you’re interested in Black Widow or if you’re new to her story then you’ll like this collection. I think it would be a great introduction to readers who don’t know much about her story. Plus, the artwork is beautiful! There is a tiny bit of profanity in the story, but it also isn’t meant for children, so that shouldn’t be an issue unless you’re buying it for a middle schooler that you don’t want to read it. Honestly, it’s not a lot and it didn’t bother me,but yeah…just making the note in case you decide to buy it for a kid. Another thing to note is that the stories have a fast pace. Obviously comic issues are short, but I never once felt that they were long and drawn out because of how engrossed I was in the story. Again, I highly suggest looking into this one! It’s currently sold out on Amazon in paper form, but the ebook version is clear and easy to use. I love the fact that you can even double tap on a panel to enlarge that panel, but it is never necessary. Trust me, I have terrible vision and I never once needed to enlarge the panel, but it’s still handy to have available. That’s one great option that you can’t get from paper, so…plus one to ebook comics! Who’s your favorite comic book character? First things first….I am SO excited for Carry On to release! I’m a big fan of Rainbow Rowell and Fangirl is easily my favorite book of hers. I felt like I completely understood the characters in that book as well as the situations. In fact, the entire time I kept thinking, “Man, I wish that I could read Carry On. Simon Snow sounds awesome!” Well, now we can read it! 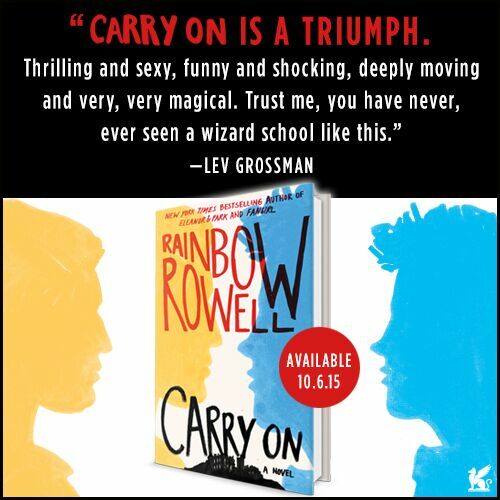 Carry On is releasing on October 6! That cover? So simple, but it’s still so eye catching! The summary alone should be enough to hook in a reader who maybe didn’t already read Fangirl to know about the story. If you preorder the book then there are some perks via the publisher, however…it’s only $8.99 to get on Kindle! That’s a GREAT price AND you can take advantage of the preorder perks! Go HERE to preorder Carry On! I can’t wait for this book! I was so engrossed in the story during Fangirl, so i’m ready to see why those characters loved the story too! Two more weeks! I loved this book! I’d easily give it 3.5/5 stars! First, I like books that go into cults or religion. I don’t know why, but they always interest me. Vivian came home from a “rapture eve” party to find two holes in the ceiling and her believer parents missing. I will say that the only thing that bumped Vivian Apple down for me is that it did somewhat drag a little in the middle. The beginning and the last quarter of the book had me crazily hooked, but parts of the middle had me fighting to keep my attention focused on the book. Vivian and Harp are such a great duo and I loved their friendship and banters back-and-forth. The reveals at the end left me with questions, so I’m glad that the second book is already out, but I really don’t even know where the book could be going. I can’t say much more on that without spoilers, so I NEED someone else to read this so I can discuss my ideas. Where is this series going?? Read it. Love it. Help me make sense of my emotions about it? So I’m getting sporadic with my reading again. In fact, Goodreads currently says that I’m reading, I think, 5 books. I’m only actively reading 3 of them. I hate reading more than two books at a time! Things get confusing and I feel like I’m abandoning the other books when I do that. It’s a weird thing though- I get in moods for a certain style of book and that’s how I end up with so many. I think most people end up reading more than one thing at some point. However…I finally started THIS lovely book and am loving it! I’m reading it online (Thanks, Randomhouse via Edeilweiss!) and it’s a bit of a struggle due to font sizing, but I still enjoy it. I can’t wait for a print copy. I’ll have a review when I finish, but so far…whoa. It’s really different and doesn’t feel like I’m reading 600 pages at all! I cannot WAIT to purchase this for my library- my students will love it! 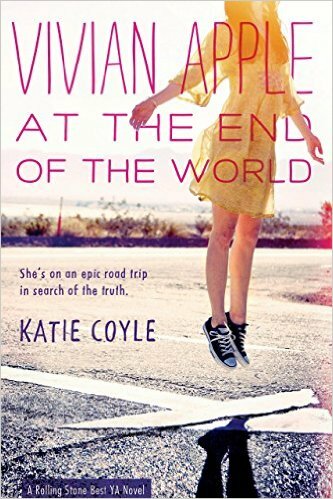 I’ll be back tomorrow with a review of one of my other current reads, Vivian Apple at the End of the World. I’m about halfway done with it right now and also love it! Hope you’re reading something that you love! Drama with substance! + HELP! The ever (not to ME…) intriguing “drama” books. I get the appeal. Really, I do. They’re meant for high interest-low level. I get it. I am NOT judging students by what they like to read. I promise I’m not. I’m happy they’re reading! Okay now back to my point…I get that “drama” books, as my students call them, are close to reality for many of today’s teens. I understand. However, I also don’t really want them to think the rough lifestyles and poor choices found in those books are okay. I’m GLAD that they think they can relate to the characters in those books, but…I wish they’d aim higher? Is that terrible? Here’s my aim…there is realistic fiction (oh, hey…look, y’all…that genre has a NAME!) that is both well-written AND still relatable. Personally, I also don’t want to read realistic or contemporary fiction that doesn’t seem, well….realistic. This is why we NEED diversity, y’all. I want these kids to have characters that they can relate to, but that aren’t miles beneath them in style and content. I love me some contemporary romance, but I need those stories to also have a broader range of characters at time that the average high school teenager can relate to. 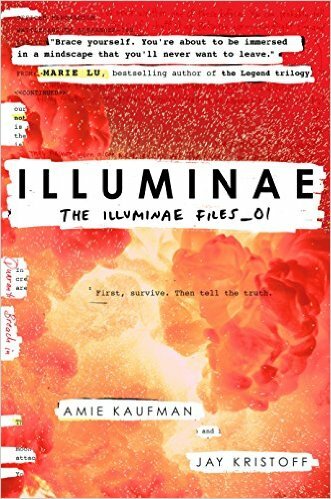 What are some of your favorite contemporaries that I can get students hooked on? Release Day: Queen of Shadows!